Vampire Weekend's newest feels like an all-star stylistic reunion between '80s Paul Simon, Peter Gabriel and Sting during The Police years. While listening to the album the first time in the car (strangely, one of the few times I've listened to a CD in a car in the last two years), we came to the conclusion that Vampire Weekend could just as easily be billed as Officer Simon Gabriel and that we wouldn't be surprised to hear a little "In Your Eyes" or "Me and Julio Down by the Schoolyard" mixed in with the new material. Specifically, an opening track like "Horchata" with it's hand-drummed, pseudo-African/Reggae vibe (really, a Vampire Weekend staple) feels like the infusion-heavy mid-80s music. Knowing that the album was inspired by and composed in reverential contrast to The Clash's Sandinistas seems only to prove that Contra is built as an '80s- pop-punk-funk statement of artistic purpose. It's an art rock revolution of sorts, but where some bands choose to alienate all audiences but those stalwart fans with obscure sound and dissonance, Vampire Weekend welcomes everyone into the gallery. Knowing and appreciating the art-pop of the 1980s is not a requisite to appreciate Vampire Weekend, but it adds layers to their composition that deepen the solid, bombastic style illustrated so well on their self-titled first album and now on Contra. As a sophomore album, Contra functions both as a dose of proven formula that made Vampire Weekend an instant success in 2008, and as a taste of their advancing, maturing sound. Rather than attempting to crank out songs with the same bounce and hook as the first release, we see the some of the social commentary and darkness from "The Kids Don't Stand a Chance" coming through with greater emphasis now. There's a lot more electronic tempo stuff happening here too, making the melodies complex as they climb up and down the register. This is incredibly evident on the clearly Clash-esque "White Sky" that alternates between a chorus of barking wails and verses that function as straightforward pop pieces. And then, again a clear Clash influence comes on track 3 "Holiday". 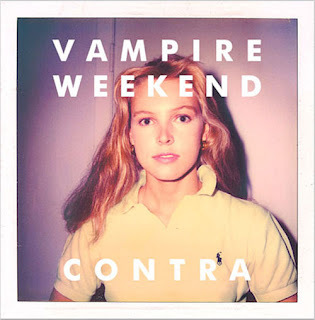 Ultimately, Contra sounds quintessentially Vampire Weekend without feeling stale or too comfortable. This is the exact opposite of a sophomore slump. What really impresses me, in light of my last post about God Help The Girl, and then previously about The Decemberists' The Hazards of Love is that these conceptual, heady, project albums keep on coming. The 21st Century may mark the beginning, and hopefully not the apex, of a music reawakening. Songs are no longer just about individuals presenting their personal poetry to music (I'm looking at you Jewel...), they are now about reflecting the genres that came before and testing how stylistic stretches and the bending/mixing of those genres can open up an entirely new field of music. Where in the '80s the forefront seemed to be electronic future-rock, and the '90s brought the roots of hard rock and punk back, these 2000s and '10s seem intent on mixing it all together in a giant pot, throwing in a bit of classical, jazz, blues, et al., and letting it simmer into a stew. (I might be hungry for stew later.) In any case, Contra is exceptional, honesty, artistically complex and experimental, but all imminently accessible. I'd give it a 9 or 4.923 stars if I had established those scales previously. But really: believe the hype. Vampire Weekend is really something special.